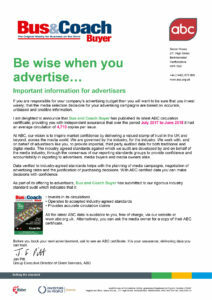 Bus and Coach Buyer has been leading the way for 30 years and is the industry’s longest running free weekly title. There is a reason for our longevity – we are the number one place to advertise and buy buses, coaches and minibuses of all makes and models, along with a wide ranging selection of products and services. 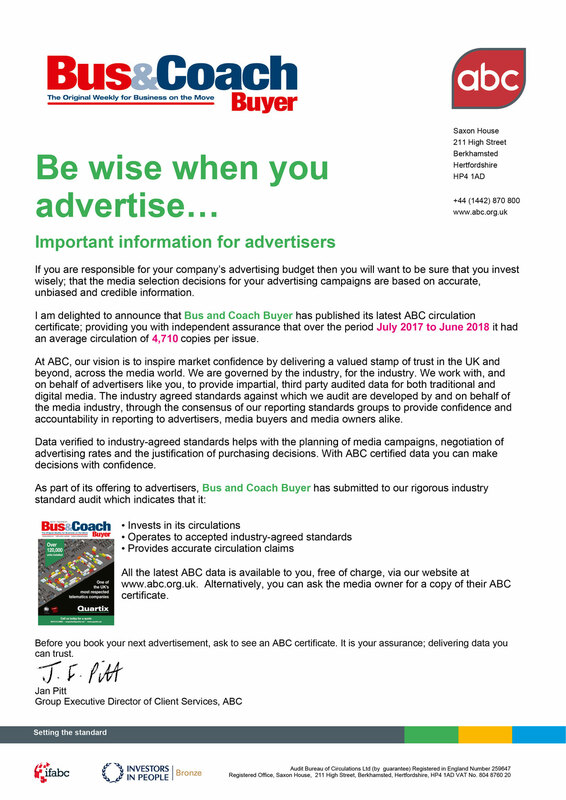 (certificate issued 01 August 2018) it had an average circulation of 4,710 ABC Total and is known as the magazine that gets read by the serious buyers. Our coverage is comprehensive, covering bus, coach, minibus and community transport operations, as well as the products and services that support them. Our editorial staff delve into the industry to bring you the latest news and reviews each week. Our goal is to present the stories that matter to you most, to keep you informed and up to date. Our Sales Team have 40 years experience in the industry and pride themselves in providing a personal and friendly service. To find out how we can help you reach your target audience, call them now to discuss your advertising needs. All of this, every week, free of charge.